Despite scoring six times in the final five games of last season, and continuing in a similarly rich vein of form this term, the speedy Fiorentina winger remains unloved by many Viola fans, some of whom still regularly single him out for abuse and tend to regard him as too inconsistent and too flashy in his lifestyle. And it would appear that his acrimonious relationship with the ultras in the north end of the Artemio Franchi stadium is not helped by the fact that he is a Roman, from the commune of Velletri to the south of the capital. 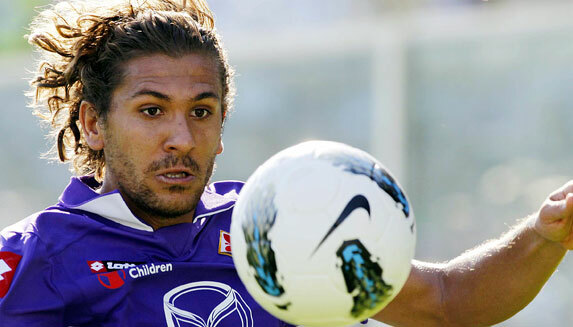 “The same fans now singing my name were, not long ago, insulting my girlfriend and I in the street,” declares Cerci, who was given his professional debut at the age of 16 by then-Roma coach Fabio Capello but never quite managed to establish himself there. “I won’t forget. I was the scapegoat. Maybe because I’m young. Maybe because I’m a Roman. Although his affinity for trouble – which in the past has included spats with recently-sacked Fiorentina coach Sinisa Mihajlovic and a much-publicised clash with a traffic warden – does attract the wrong sort of headlines, his ability to operate on either flank, particularly on the right from where he can cut inside and shoot powerfully with his left foot, has seen just as many admirers calling for him to be given a first full cap for Italy. “I try to copy the play of a Messi or a Robben, to always look to take on and beat defenders,” he says of his role models. Signed from Roma for £3.5million in August 2010, his problems with Fiorentina’s fans meant he was straining at the leash to head for England when Manchester City made an offer for him in the summer. But as keen as City boss Roberto Mancini was to sign Cerci, an asking price of £6m was more than the Premier League club were willing to pay. Not that Fiorentina were fighting tooth and nail to hold onto him. With Mihajlovic reportedly set to switch to a 4-3-1-2 system for the current campaign, there seemed absolutely no room for a winger of Cerci’s ilk. However, when the playmaker Mihajlovic craved failed to arrive he decided to stick with his tried-and-tested 4-3-3, and Cerci was able to show off his skills.